So sorry, this contest ended on May 8, 2017. Vote on your favorite entries below! We provide the cartoon, you give us the caption! Enter the April-May “Name That Caption” contest by May 8 for your chance to win. Prizes go to the top three entries. 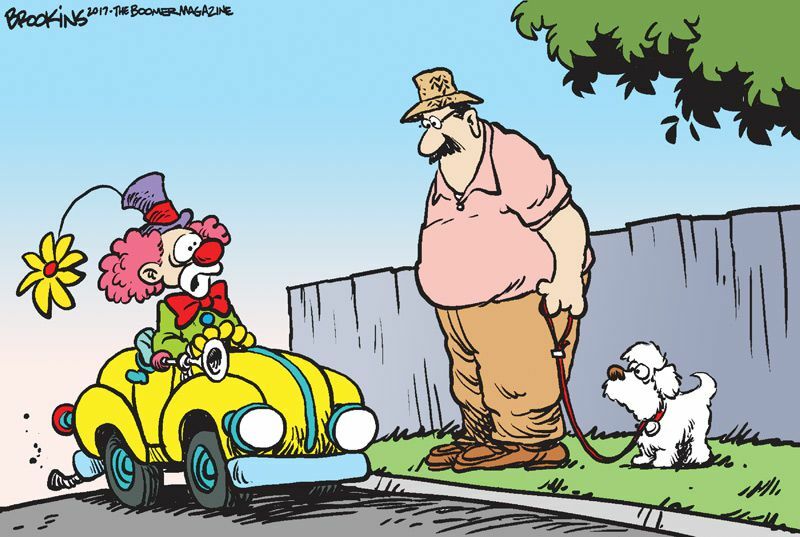 Mark Saunders for caption "Uber driver Sparkles realizes that the clown car may not have been the vehicle for this job." Peter Young for caption "“Which way is Washington D.C.? I think I could blend in there.”"
Carol Davis for caption "“I’d offer you a ride, but there are 10 others on board already!”"
Bruce Miller for caption "“Really? You said ‘Tendin’ the hound’?”"